This award will be given to educators that leverage technology to transform their student’s experience, drive innovation, accelerate learning, and increase access with open-source knowledge exchanges. The Technology Enabled Learning Award will help supercharge the implementation of these practices to new or existing program and will focus on providing funding to expand access to many more classrooms and students across Colorado. The goal is to fund smarter, more inspired experiences for all students through practical teaching solutions rooted in possibility. CHECK BACK IN EARLY 2019 FOR INFORMATION ON THE SUCCEEDS PRIZE 2019 APPLICATION REQUIREMENTS AND DEADLINES. Any person or group of people working in a public school or school district, including public charter and CMOs. What are the Critical Components? What new technologies or materials are you incorporating into your teaching? How do these tools enhance your students learning experience, drive innovation, entrepreneurialism, and accelerate learning? How are you sharing these practices with other educators and students? Coaching Workshops: Colorado Succeeds and mindSpark Learning are pleased to offer a summer coaching workshop for educators interested in practicing their pitch and refining their ideas with business leaders and other education innovators. Application: Applicants are required to submit a 2-minute video pitch and 500-word written application addressing the critical components of the award. Review & Finalist Selection: Video pitches will be reviewed by a selection committee of education, business, and philanthropic leaders in Colorado. The committee will identify 5 finalists for a live-pitching event in Denver. Live Pitch: During the live-pitch, finalists will need to present their work to the selection committee in a shark-tank-style pitch as well as participate in several minutes of Q&A. Live Reveal: The $15,000 prize winner will be announced at The Succeed Prize live reveal celebration (2019 date TBD). Finalists and winners will be asked to participate in storytelling and a professional development campaign to highlight their work throughout the year. 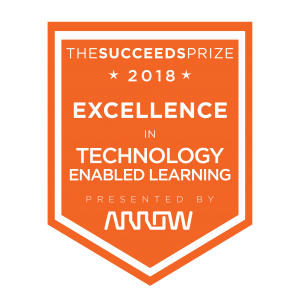 The Selection Committee supports the application review process, participates in the live pitch event, and determines winners in the Excellence in Technology Enabled Learning Award, Sponsored by Arrow Electronics.